Liverpool have been pitted against Roma in the Champions League semi-finals, and fans have responded bullishly to the draw. The Reds earned a magnificent 5-1 aggregate victory over Man City on Tuesday, prevailing 2-1 at the Etihad after second-half goals from deadly duo Mohamed Salah and Roberto Firmino. Supporters have been waiting with bated breath to see who Jurgen Klopp‘s side would face in the semis, and all has now been revealed. Roma will stand between Liverpool and a place in next month’s final in Kiev, with Salah doing battle against his former club. The Giallorossi enjoyed a stunning win of their own against Barcelona, overturning a 4-1 first leg deficit to win 3-0 on Tuesday. The first leg will take place at Anfield on April 24/25, with the return fixture at Stadio Olimpico on May 1/2. Bayern Munich take on Real Madrid in the other tie. Here’s how fans have reacted to the news on social media and our forums. Clean sheet at Anfield and we should be going to Kiev. Fantastic draw. Bring it on! What an occasion for @22mosalah. Really difficult team to play if they turn up on the night. Not to be underestimated but if we play to our ability we can do this. Clean sheet at our place is a must I feel. Proper exciting though. Can’t wait. C’mon you Reds. – Martin Emsley on Facebook. Roma have their qualities, but Liverpool *should* beat them over two legs, even with the second leg away. Well, this is very exciting! Happy with Roma, especially knowing there won’t be any complacency from the team just because they aren’t Bayern/Madrid. Glad we avoided the Bernabeu. It’s been a bit of a graveyard for unbiased officiating in recent years. – LFCFFC on the forums. Would rather have the trip to Rome first but best possible draw that. ? Exciting Champions League draw! Rome is a fantastic city too. What a great opportunity for Liverpool to meet Real Madrid in the final! What a draw!!! If we can mirror a similar result both home and away like City then…Boooooom! – Ady Parsons on Facebook. Just get Houllier to march out before kick-off at Anfield and we've got this. 2nd leg will be very very tough at their place. Think this is a great draw for us. Roma had a great result v Barca but they are miles off the pace in Serie A which is not as good a League. Would have preferred second leg at home but all in all a great draw. – KMD1951 on the forums. 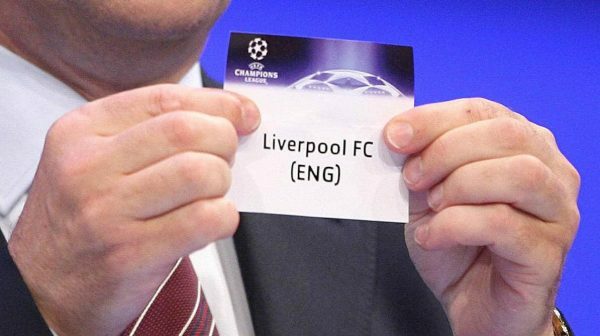 Liverpool are favourites to reach the Champions League final. Sounds pretty good that, doesn't it? Would have preferred second leg at home but not a bad draw considering. Roma in semi for a reason though. No easy games at this stage ?????? Have #LFC had any big European Cup games in Rome before? ? Can’t wait to see how VvD puts Dzeko in his pocket. YNWA!!! – Aleksandar Pendzerkovski on Facebook. Roma will also be happy with the draw I think. 2nd leg in Rome & they also avoid Madrid & Bayern (1 & 2 in UEFA Club coefficient rankings). They have a strong spine with Alisson, Manolas, de Rossi, Nainggolan, Strootman & Dzeko. A lot of experience in their ranks.